While some of his classmates wanted to execute senior pranks that would potentially disrupt classes, Missouri high school student Kylan Scheele opted for some tomfoolery that was a little more chill. But while Scheele’s internet high jinks didn’t cause a headache for school janitors or violate any health codes, that “loss of students” comment concerned school administrators enough that they took action. “I decided to say the reason we’re selling this is because of ‘the loss of students,’ because the senior class is graduating,” said Scheele. 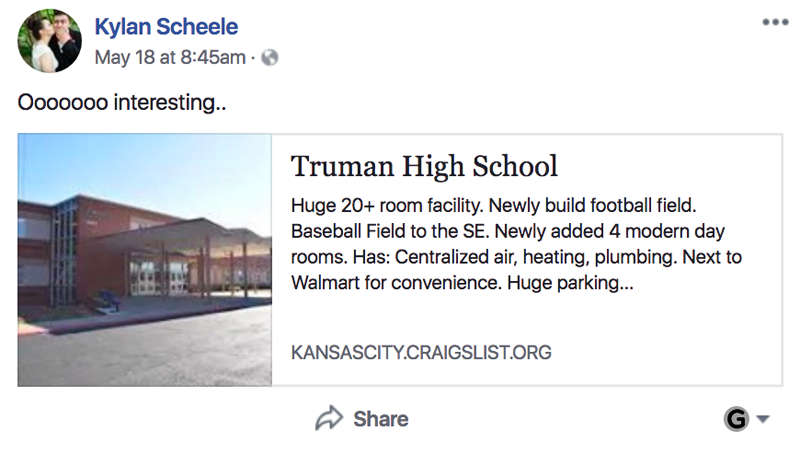 Independence Police Department detectives investigated the Craigslist ad and decided not to pursue criminal charges, but told Scheele to remove the post and suggested he speak with school administrators. Out of an abundance of caution, administrators and police investigated and determined there was not a credible threat. A student who makes a real or implied threat, whether it is deemed credible or not, will face discipline. Due to the heightened concern nationally with school violence, we have extra police officers for the remainder of the school year and will have additional officers at graduations for all of our high schools.